Oh hey, friendlies! Happiest Labor Day wishes to you all. I hope you’re spending your day with yummy food, good company and preferably a cabin/beach/park/sunny day on the side. So in the interest of convincing you to make these muffins as soon as humanly possible (which I hope isn’t too difficult to do) and in the interest of letting you get back to your holiday shindigs, head over to Eat Your Heart Out for the full post and recipe! Spoiler alert: I talk about how these muffins sum up my personality in carb form. It gets weird/awesome. Whoa! These are so cute and sound delicious! Headed for the recipe now! This is my fav coffee drink flavor when I feel like a treat and these look like an awesome accompaniment!! Who left this comment and never gets sick of doughnut muffins? This gal. These are gorgeous, Stephanie! I love caramel macchiatos! I am all over these! LOVE this recipe! Julie — Oh yes, the vacuum cleaner syndrome I know all too well. 🙂 Yes, these do freeze pretty well, actually, glazed or not! Enjoy your weekend and that spaghetti sauce (which I am also completely out of now, even though I froze some for later. I’ve got my work cut out for me today ;)). Tieghan — Thanks, girl! Happy Labor Day to you, too! Gerry — Mine, too! Thanks, friend! Donut + muffin = winning! I too have no idea if people say that anymore, but whatever. These look craaaaazy good! Your recipes are so creative. I love fusion dessert recipes! Or rather, just shoving together as many desserts in to one personal sized delight. I’m not much for donuts, but I love coffee and caramel. I’ll have to give these a shot. Also, your writing style is so entertaining. Kind of ADD/stream-of-consciousness/hilarious. Crazy good! Heading over to check out the recipe now! Yes please to getting my coffee fix in muffin form. These are gorg! Natasha — Well if you and I are the only ones left saying it, that’s good enough for me. 😉 Thanks, gal! Lauren — Aw, thank you! And I’m glad at least someone appreciates my ADD writing: besides the husband (because he has to ;)). Laura — Right?? Coffee and carbs = best combo. 🙂 Thanks, friend! Seriously delicious! I have company arriving this week and these doughnut muffins would be an outstanding way to begin our day! Holy OH-EM-GEE!!!! These are.. I can’t even think of what to say.. They get 2 snaps and an around of applause. Deb — Perfect! I hope you all enjoy them! Erika — Haha! Thanks, friend! So glad Labor day has come and gone cuz now it’s “officially” time for fall, right? I’ll start with one of these!! Oh my gosh… wow! These look incredible. 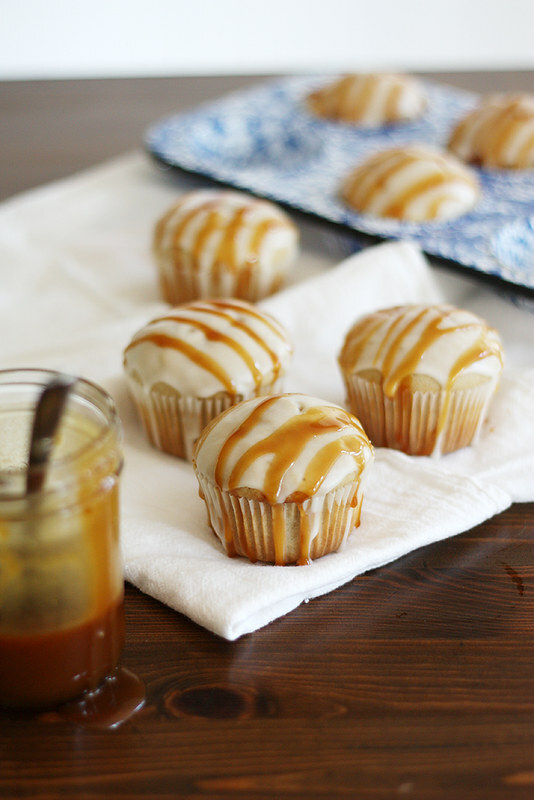 I love that drizzle of caramel flowing off the edge of the muffins. Divine. These are so gorgeous, Steph! I could eat the whole dozen (although… I probably shouldn’t, huh?). Steph — Yes yes and yes! So ready for fall! My exact reaction when I read the title of this post on my feed: WHAAAAAAAAT? Yeah, I’ll definitely be making these. These look soooo good! Definitely amazing looking, and I wish I had one right now. The Narrowboat Baker — Thanks so much! Rachel — I wish I did, too (but I don’t because I ate them all ;)). Thanks, dear! Yaaaay, I love these! My bf and I joke about caramel maCCCCCCHiatos and pronounce the name like real tool bags – but truthfully, we’re pretty obsessed with them. Macchiato in cupcake form? May as well be our signature dessert to sum up our whole relationship. Gorgeous! I love caramel macchiatos! These doughnut muffins sound so good! Julia — Lol, sounds like something the husband and I would do too! 🙂 Thanks, love! These muffins look incredible, Steph! I think I’d probably BOUND out of bed if it meant I could wake up to these… Wonderful recipe! These are so naughty!! And yes, winning is totally still a thing! whooa, I don’t know if it would be safe for me to get the recipe for these.. they look like the kind of thing I’d eat ALL of and then try to pretend that it never happened. I still say winning. Usually with a hashtag in front of it. It’s totally cool. Also – caramel macchiato is kind of my favorite fancy drink ever. Off to check out your post! Gaaahhh!!! I am an iced Caramel Macchiato addict…. and I do love a doughnut so these need to be made asap! Hi Stephanie, I just discovered you blog and I’ll be back. These muffins look fantastic! Looking forward to exploring Girl vs Dough! Great post! Bill — Thanks so much for stopping by!